Alta is one of the most exclusive communities located in Palm Springs Real Estate. These award-winning homes offer the finest in outdoor and indoor living, featuring vanishing glass walls and upside down roofs that maximize the beauty of the desert and the breath-taking views of the San Jacinto Mountains. Featuring 67 contemporary desert homes, Alta offers the grandeur of custom homes ranging in the $5-20 million dollar price range at a price that makes this marvelous piece of California real estate a dream within reach. Alta has three floor plans ranging from 2,875 square feet to 4,783 square feet and some homes have as many as 6 bedrooms, 6 baths, and 4-car garages. A number homes include separate dining, living, and entertaining areas as well. Ceilings heights range from 10 to 15 feet. For outdoor entertaining and family fun, some homes have covered outdoor living areas and very private retreat areas. You will be amazed at the style and quality of the fixtures and finishes, some kitchens have Thermador appliance packages surrounded by spacious workspaces, center islands, natural slab stone countertops, and large walk-in pantries. Bedroom are equipped with a walk-in closet and plenty of storage areas throughout the home. A fireplace can be found in the master bedroom and the great room or living room. 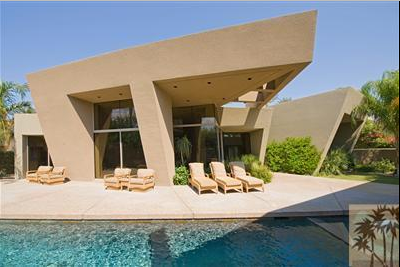 Alta offers the most innovative homes available in the Palm Springs Real Estate market. Located within minutes of downtown Palm Springs, you can enjoy your desert getway and the exciting life of Palm Springs. These homes are perfect for just spending a relaxing day enjoying the magnificent views of the desert landscape. Isn’t it time you found your Palm Springs Real Estate with luxury options that you never dreamed possible and prices that put them within your reach. If you would like to see property at Alta in Palm Springs, please email us, or call us at the number below. Elaine Stewart is committed to helping you find the home of your dreams.